Aml plays the lead role of “D” in Idris Elba’s directorial debut YARDIE for Studio Canal, which premiered earlier this year in SUNDANCE 2018. 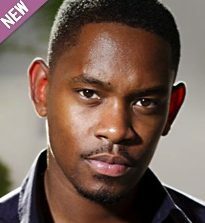 He is well known with his standout performance as “Trife” in the cult classic, feature indie film, Kidulthood (2006) which he was nomination for ‘Best Newcomer” Screen Nation Awards, as well as a spot in The London Times list of “Best New Actors of the Year”. Other credits include Lee Daniel’s critically acclaimed and award winning feature film, The Butler (2013), Beyond The Lights (2014) and was a lead in Fox’s blockbuster hit, The Maze Runner (2014). He also co-starred with Jennifer Lopez and Viola Davis in the feature film, Lila & Eve and played the role of ‘Capheus’ in the critically acclaimed Watchowski’s Netflix series, SENSE 8. He is currently filming the up-coming feature Inside Man 2.